Attache offers over 300 unique corporate housing and furnished apartments in Washington DC for 30 days or longer. Click here to submit a rental inquiry or feel free to Browse. 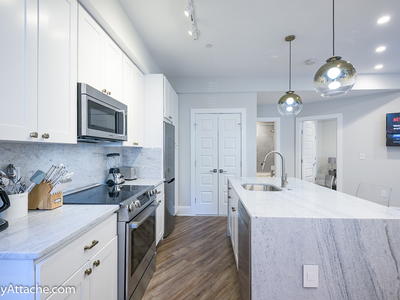 This fully-furnished Penthouse unit with 1,000 sq-ft outdoor terrace features, luxury 2 bedrooms, 2 full 1 half bathrooms condo is on the 10th floor of CityCenterDC. The property features hardwood floors throughout, bedrooms are both Queen beds with walk-in closet, ensuite bathrooms. All stainless steel appliances including a&nbsp;dishwasher, and&n... see more. Fully furnished spacious loft style 1-bedroom, 1.5 bathroom condo in the Yale Steam Laundry Building. It boasts high, exposed ceilings on the unit's two floors. Both floors feature exposed brick walls, and larger than life 16 foot windows. The kitchen is equipped with top-of-the-line Miele appliances and granite counter tops. Other features in the... see more. 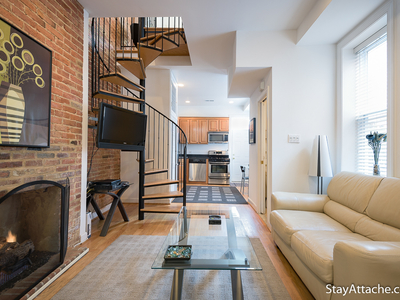 Stay Attache is excited to offer the finest corporate housing and furnished apartments in Washington DC – Designed for those looking to stay for as little as a month or longer. Our suites are perfect for use as corporate housing or a short term rental while staying in the area. Call us today and let us show you the best temporary housing accommodations our city has to offer!